Jenner, Henry Lascelles, D.D., was educated at Trinity Hall, Cambridge (LL.B. 1841, in honours; D.D. 1867). 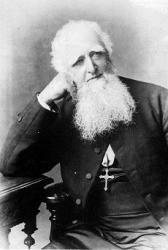 Taking Holy Orders in 1843, he held several appointments until 1866, when he was consecrated Bishop of Dunedin. He retired in 1871. He is at present  vicar of Preston-next-Wingham, Diocese of Canterbury, to which he was presented in 1854. His hymn in the 1889 Supplemental Hymns to Hymns Ancient & Modern, "Christians, sing out with exultation" (Christmas), is a translation of "Faisons éclater notre joie." See p. 391, ii. Jenner, H. L., p. 1574, i. Bp. Jenner was born in 1820, and died in 1898. In C. W. A. Brooke's Additional Hymns, 1903, Nos. 962-966 are by Bp. Jenner and "A. Jenner." They are the "Catechism in Verse," and consist of 50 stanzas and a "Kyrie." They are well adapted for singing in connection with catechising in Church and School.